Pharmacy technicians perform inventory, process prescription orders, and assist in other technical functions of the pharmacy that do not require a pharmacist’s judgment. They are essential to the pharmacy’s workflow as pharmacists focus on patient counseling and other core responsibilities. In community pharmacies, technicians serve on the frontline of patient care. They are usually the first people patients see or talk to over the telephone, spending much of their time receiving prescription requests, documenting patient information, selecting and counting medication and liaising with insurance companies. Pharmacy technicians in hospitals prepare prescription orders and deliver to the nurses’ station, prepare IV bags, and maintain pharmaceutical instruments. Statewide, certified pharmacy technicians earn a mean hourly wage of $14.83 per hour or $29,658 annually. The average salary for job postings in Vermont is approximately 10% lower than the national average due to the lack of training and certification requirements from the Vermont Board of Pharmacy. Any individual who performs duties that would constitute practice as a pharmacy technician must obtain registration from the Board of Pharmacy. Pharmacy technicians with a lapsed registration should seek to renew the registration instead of applying for a new license. Registration requirements in Vermont are simple. Applicants 18 years or older should submit the request on a Board-approved form along with the application fee and certificate of formal training if available. Training and national certification are not necessary to register in Vermont. Vermont pharmacy technician license holders must comply with the state’s regulations governing their practice. They must wear a badge identifying their name and position while on duty and keep a copy of the registration certificate on prominent display at their primary place of employment. Pharmacy technicians may perform non-discretionary tasks under a pharmacist’s supervision. They should not perform packaging and other tasks if a pharmacist is not on duty. Pharmacy technicians may not perform any act that requires the sole professional judgment of a pharmacist. Ultimately, the pharmacist remains responsible for the actions of pharmacy technicians and must verify a prescription before dispensing to the patient. Cashiers and delivery persons who enter or have access to the prescription area are not exempt from registration and should register as pharmacy technicians before working in those areas. Pharmacy interns registered with the Board do not need to register as a pharmacy technician to function in the role. All pharmacy technicians have the responsibility to renew their licenses biennially to continue practicing pharmacy. Aspiring pharmacy technicians 18 years or older can submit a request for registration with the Vermont Board of Pharmacy. Currently, there are no requirements for formal training to register as a pharmacy technician. The Board of Pharmacy does not request proof of high school, employer-based training or institutionalized training to register candidates. The low barriers to registration may change as pharmacy boards across the nation adopt higher standards in response to the expanding roles of pharmacy technicians. Keep in mind that employers may require technicians and technician trainees to have a minimum high school education as a requirement for employment. The Vermont Board of Pharmacy does not conduct criminal background checks by default. Instead, candidates must truthfully respond to all questions relating to “Good Standing” and “Credential and Fitness,” and the Board will conduct a criminal background check or an in-person interview if they deem necessary. Providing a “yes” response to possibly incriminating questions will not automatically disqualify you from registration, depending on the nature of the conviction or disciplinary action. Providing false or inaccurate information may result in disciplinary actions or denial of licensure. At this time, there are no state or federal requirements for formal training or certification in Vermont. However, more employers are calling for trained and/or certified technicians as pharmacists rely heavily on a technician’s support. A few employers provide on-the-job training with the agreement that the technician pursue certification to retain employment. Apart from on-the-job training, aspiring pharmacy technicians can pursue training at a community college or technical institute. Unfortunately, there are no ASHP accredited colleges in Vermont, so student need to locate institutions accredited by another recognized agency. Admission into pharmacy technician programs at technical colleges and universities requires a high school diploma or GED, good health, good moral character, immunizations, and proficiency in basic math and English. Some schools may administer a placement exam to determine a prospective student’s eligibility for enrollment. Accredited training programs give students every opportunity to explore their interest in pharmaceuticals and reach their professional goals. From classroom instruction to hands-on learning in sophisticated labs and mentorship in a pharmaceutical environment, students gain every opportunity to maximize their potential and succeed on the job. The course content covers more than just the basics; students learn policies, procedures, professionalism, and patient care. They learn how to calculate dosages and read and interpret prescriptions. The clinical training may take place at a community pharmacy or hospital where students work hand-in-hand with pharmacists and other members of the patient care team. The clinical is a valuable resource for preparing for the world of work. Some programs also provide review classes and study materials for the PTCB exam. Many students complete their pharmacy technician training in less than 12 months, which makes it an appealing option for short-term certification with innumerable benefits. The shorter term classes lead to a certificate or technical diploma. A few colleges offer the option for earning an Associate of Science degree, which can take up to 24 months. Essentially, duration of the program depends on the type of credential. While employers may be happy with a graduate from a certificate course, graduates from degree programs can take on greater responsibility, easing the burden of overworked pharmacists. An individual with an associate’s degree is also more likely to earn more and advance to other careers in health. The cost of training is as varied as the duration of programs. The training at Vermont Tech costs $1,299 for a six-month certificate course. Students must also budget for textbooks, course materials, uniform, and administrative costs. Employer-based training is the best way to secure free tuition, state registration, and national certification. The Pharmacy Technician Certification Board designs and develops the Pharmacy Technician Certification Examination (PTCE), which is administered by Pearson Vue. The exam is voluntary in Vermont, but individuals who pursue certification demonstrate their competency to act as a pharmacy technician. Employers look favorably on individuals who pass the exam as they know they would have a standardized body of knowledge that is recognized by pharmacy employers nationwide. Pharmacists can assign extra tasks to Certified Pharmacy Technicians. Therefore, employers are more than willing to provide incentives, such as reimbursement of costs or higher salaries, to certified technicians. Candidates eligible for certification are those with a high school diploma or GED, no felony convictions, and the aptitude to pass the multiple choice exam. After successfully passing the exam and meeting the PTCB’s requirements, technicians earn the title of Certified Pharmacy Technician (CPhT). 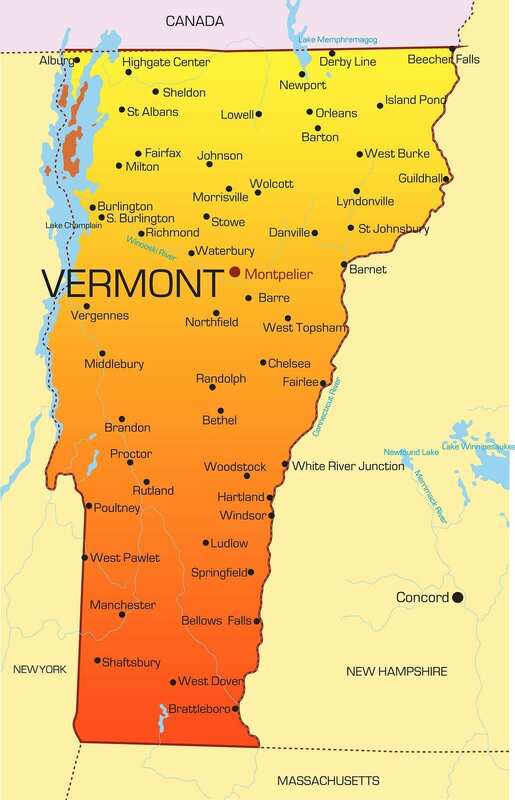 The PTCE is available at Pearson Vue testing centers across Vermont. But candidates must first submit an application through the PTCB’s website and receive the authorization to test. The two-hour test contains 90 multiple choice questions that assess candidate’s understanding of six knowledge domains. The cost of certification is $129 for two years’ certification. In order to maintain the status, pharmacy technicians must complete the continuing education requirements and pay the biennial renewal fee of $40. 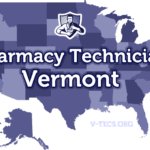 Vermont defines a pharmacy technician as an individual who performs tasks relative to dispensing under the supervision and control of a licensed pharmacist. The role includes data entry, counting and labeling, selecting drugs from the inventory, and ordering pharmaceuticals and stocking shelves in the prescription department. Therefore, cashiers and delivery personnel who have access to and enter the prescription department must also register as pharmacy technicians. All applications for registration must be complete before submitting for the Board’s review. Review the requirements for registration and fill out the registration form or submit your application online. Sign and date the final page of the application. Enclose the application fee of $50 using a check or money order made payable to the Vermont Secretary of State. Applicants using the online portal can pay using a credit or debit card. All registration fees are non-refundable. Include a copy of your certificate of formal training if available. Training is not required for registration. Respond to the “Good Standing” declarations and the “Credential and Fitness” questions completely and truthfully. Include the name and address of your supervising pharmacist. Include a copy of court documents and a written statement outlining the details of any convictions or disciplinary actions indicated on the form. Mail the application form and the accompanying documents to the address provided below. The Board will process the application for registration within five days of receiving the form and all accompanying documents. You can check the status of your application by submitting a request for an online account and logging in using your user ID and password. The Board will provide a certificate of registration and a wallet card after approving the application. 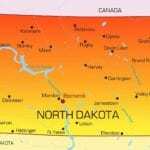 Technician licenses renew on July 31 biennially on odd-numbered years. Applicants who receive their initial licenses more than 90 days prior to the renewal date must renew and pay the renewal fee. Applicants who receive their initial licenses within 90 days of the renewal date will not have to renew their licenses or pay a renewal fee. Registration renewal is available online. License holders should refer to the Board’s letter (provided upon registration) with the information for login. The Board will send a renewal notification via email and include the license holder’s login details. You can also request a copy of your login details by emailing the Board at [email protected]. The fee for renewal is $50. There are no continuing education requirements for renewing a Vermont license. Pharmacy technicians, licensed in other states, who wish to apply for licensure in Vermont should submit an application for registration and send the verification of license request form to the pharmacy board in the state(s) of licensure. The Board (licensing agency) should verify the candidate’s status and return the form to the Board address provided below.